Alfred A. Knopf Books for Young Readers, 9780375867088, 32pp. Imagine a preschool classroom with 25 cranky kids and one beleaguered teacher. What will it take to turn this annoying day around? Readers will be amazed and amused to see what happens when Adelaide . . . apologizes. 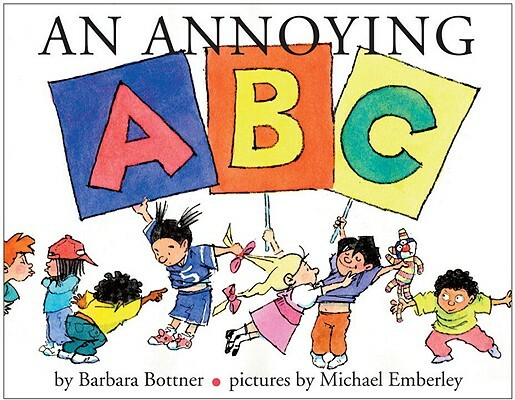 Barbara Bottner and Michael Emberley follow up their bestselling Miss Brooks Loves Books (and I Don't) with this outrageously funny alphabet book that shows that kindness can be contagious, too. BARBARA BOTTNER studied painting in Paris, worked as a set desinger, toured as part of an acting ensemble, and made animated shorts for Sesame Street before turning to writing and illustrating children's books. She is the author of more than 36 books, including Miss Brooks Loves Books! (and I Don't) and Bootsie Barker Bites, illustrated by Peggy Rathmann. MICHAEL EMBERLEY has been writing and illustrating children's books since 1979. He has more than 20 books to his credit, and he has a sister and father (Rebecca and Ed) who also make children's books. His hobbies include bicycle racing, bike riding, cycling, mountain biking, and avoiding driving. "Bottner's deadpan, minimalist text inspires Emberley to some terrific portraits in extremis--this isn't just an alphabet book, it's an encyclopedia of kindergarten deportment, from aggression to zealotry." What’s annoying? Adelaide annoys Bailey when she runs at him wearing her tiger costume, scaring him and causing him to let the gerbil out of its cage. So begins a rollicking preschool/early-elementary romp featuring kids who appear in alphabetical order with a corresponding action as Adelaide sets off a domino effect. “Bailey blamed Clyde. / Clyde cried. / Dexter drooled on Eloise. / Eloise elbowed Flora. / Flora fumed.” The pandemonium that ensues is a clever visual narrative loaded with details, such as the gerbil-escape subplot. The hilarity lies in the illustrations, typical Emberley style, done in mechanical pencil and watercolors. Children (and Miss Mabel, the teacher) in the alphabetical spotlight are rendered in full color, while the other characters are in black and white against colored backgrounds. The kids sport a variety of skin colors, hairdos and clothing, with one girl (Ida) in a wheelchair. How does the mayhem resolve? When Zelda zaps Adelaide with the water hose, Adelaide, as instigator, apologizes, and so does everyone else. For the trickier letters, Q is Quentin; X is Xavier; Y is Yves. One read-through will simply not be enough to enjoy all the fun. This would make a splendid project for a classroom to make up their own alphabetical list of names.